The fact that the world is in a state of constant change shouldn’t come as a shock. But the Great Recession that we are still feeling the effects of as I write this taught that lesson a little too quick and too painful for many. In talking to and working with a lot of small business owners over the last few years, the conversation always turns to those changes in their business. But all of the sudden the ways of doing business that used to work have either stopped working altogether or have a fraction of the effectiveness they did before. Sometimes businesses realize this and make the changes necessary to go in new directions and look for new opportunities. But sometimes they get stuck thinking they can continue to do things the way they did before, and somehow things will go back to the way they were. 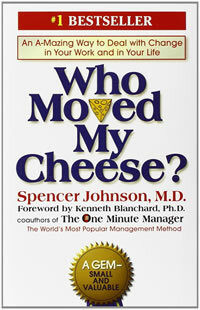 So, one day when I was talking to my Dad about this, he mentioned the book “Who Moved My Cheese?” by Spencer Johnson. So after giving it a read…Bingo. It just hits the nail on the head for the situation a lot of businesses and individuals are in today. If you have not read it, I would strongly suggest doing so…twice. Who Moved My Cheese? The Movie.